← 2012 Restaurant List – Why I will return! I am always after healthy, tasty and versatile recipes. This recipe of kingfish ceviche* with tomato salsa and mango hits the mark on all fronts. You can serve this as an appetiser or entrée for a dinner party – think spoons or shot glasses – or serve it on top of a toasted piece of wholemeal bread for a light main. 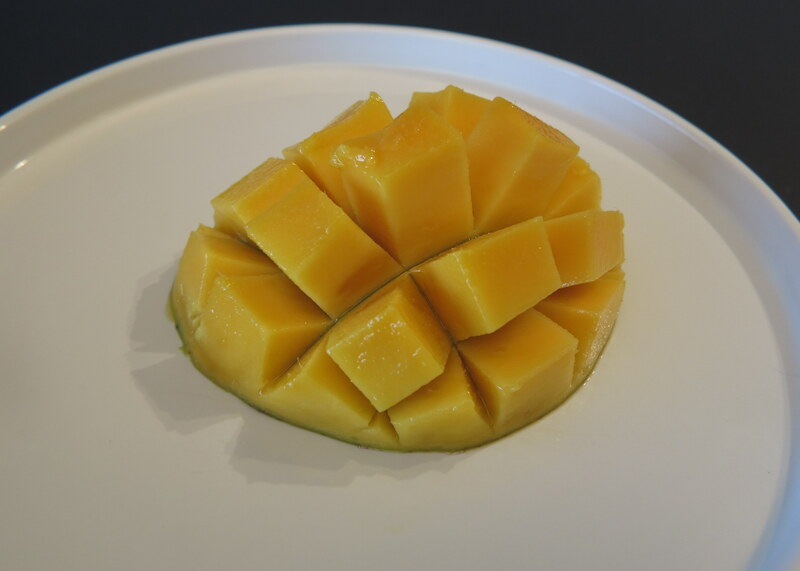 The sweetness of the mango provides perfect balance to the acidity of the lime juice and tomatoes. 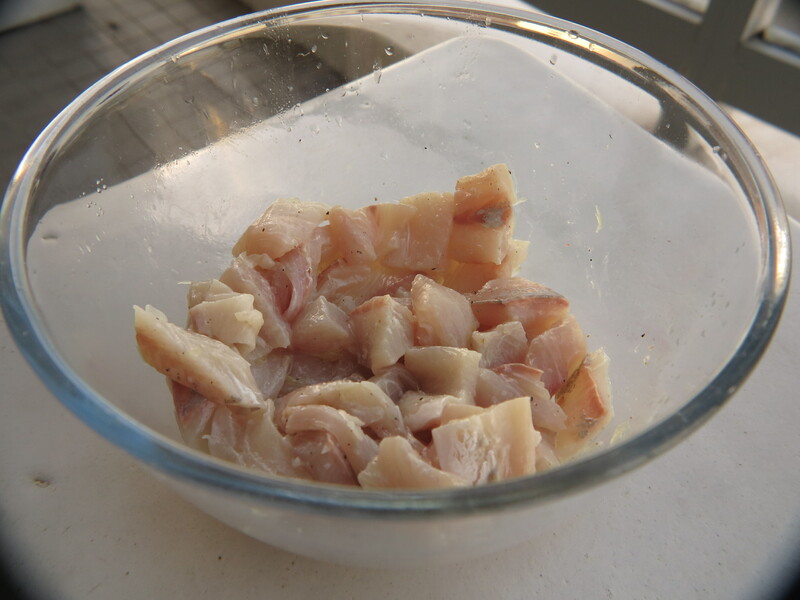 Step 1 – Marinate the fish: Using a sharp knife, trim the kingfish fillets keeping only the white flesh. Then dice the fish fillets and place in a bowl together with the juice of one lime* and 1 tbsp of olive oil. Add salt and pepper to taste. Cover with cling film and reserve in the fridge for 15 minutes. 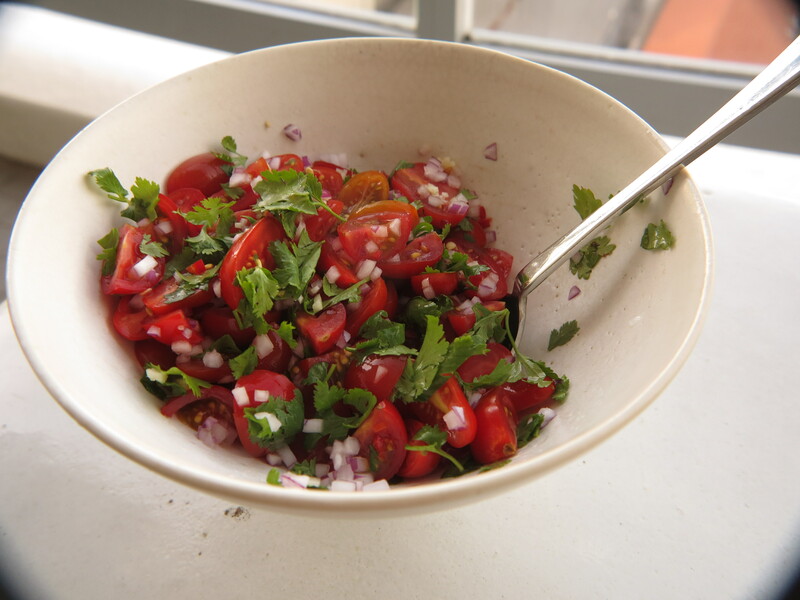 Step 2 – Prepare the tomato salsa: Wash the tomatoes thoroughly and cut in halves or quarters, depending on the variety. Place in a bowl and add one third of a clove of garlic, half a red onion and half a small red chilli, all finely chopped. Add the torn coriander leaves and mix together. 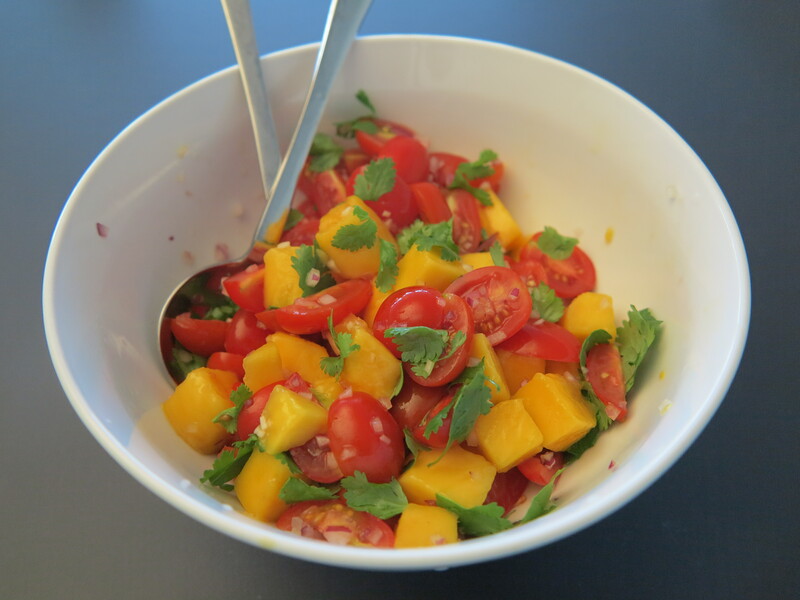 Step 3 – Prepare the mango: Dice the mango as per the picture and add to the tomato salsa. Step 4 – Combine all the elements and serve: Take the fish out of the fridge and add the tomato salsa and the mango to the fish. Mix well and taste. You might then want to add more lime, salt or pepper. Serve immediately. Kingfish can be replaced by all kinds of white fish that work well for sashimi. Snapper would be my second choice of fish that are widely available in Australia. If coriander isn’t your thing, consider replacing it with fresh basil leaves or even mint. You could also add diced avocado. I recommend a Champagne or other sparkling wine, a Sauvignon Blanc from New Zealand or a Grüner Vetliner. Ceviche is an ancient South American dish where chunks of fish are cooked by being immersed in citrus juice. It is the acidity of the citrus juice, here lime juice, which delicately cooks the fish. Unlike heating, this type of cooking doesn’t cause flavour changes. Make sure that the fish is very fresh, especially if you are going to eat it raw. How do you identify fresh fish? It should have a firm texture, a glossy look, should not be brown around the edges and should only have a slight fishy smell. If the fish is whole, make sure that the eyes are bright, black and not sunken and that the belly isn’t swollen, soft or broken. For this recipe I have been buying whole kingfish and asked my fishmonger to clean it, skin it and fillet it for me. Whenever possible, and particularly if the fish is to be eaten raw, it is preferable to have fillets cut to order as it reduces exposure to microbes and the air. I insist that my fishmonger dry fillet the fish. Fish is often rinsed under water when scaled, skinned and filleted because it is quick and simple. However it does wash away some of the natural oils that give the fish its flavour. Dry filleting also improves the shell life of the fish fillets. 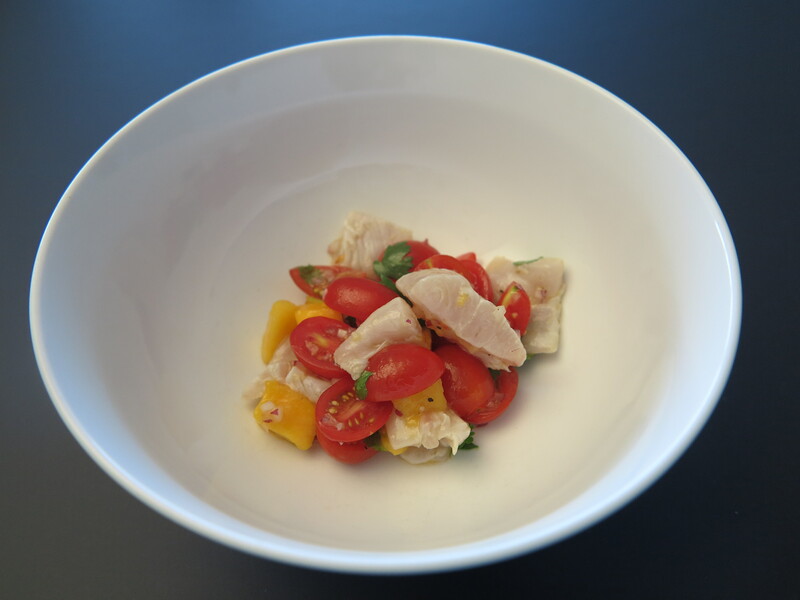 Gallery | This entry was posted in Recipes and tagged Ceviche, fresh, healthy, Kingfish, Lime, Mango, summer, tomato, White Fish. Bookmark the permalink.